1998-2002 B.S. Chemistry, Lanzhou University, P. R. China. 2005-2010 Ph.D. Organic Chemistry, Lanzhou University, P. R. China. 2002-2010 Lanzhou University, State Key Lab. of Applied Org. Chem. 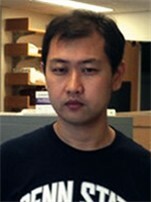 2010-2011 Postdoctor, Department of Chemistry, Chicago University, USA. 2011-2014 Postdoctor, Department of Chemistry, Penn State University, USA. Our current research program is interested in synthetic methodology, synthesis of natural products, medicinal chemistry, and Chemical biology. We are always looking to recruit talented and committed scientists. If you are interested in working in our group, please feel free to contact me anytime. Postdoctoral position available at: (http://join.sjtu.edu.cn/ZPSpecialShow.aspx?id=510). Candidates must possess a PhD, strong research skills and background in total synthesis, catalytic asymmetric, or organometallic chemistry. PhD positions are available in our group two times each year, usually starting in April or September. For international students, see: http://isc.sjtu.edu.cn (Application period：Dec. 1-Apr. 30). If you are interested in a PhD with our group, please contact me and send your CV and Statement to zhangsy16@sjtu.edu.cn anytime.